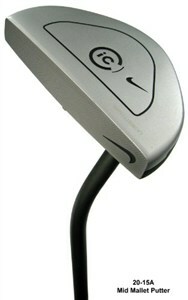 The Nike IC 20-15A Mid Mallet Putter could not be a better analogy. Dependable. Faithful. Solid. Trustworthy. Not given to frills or crazy expenditures. And... just plain cheap. It's easy to line up with, has very little visual noise to distract you from that birdie putt, and has a milled face -- no flim-flam cockamamy inserts here. No sir-ee, Bob. My friend's dad drove an old Porsche Boxter. He had long hair. My dad called him a hippie. As I grew up, I found out that he bought the sports car cheap and simply didn't like getting his hair cut. So he wasn't as flashy as I thought; he only looked that way. If you want something cheap, solid, and functional, get the Nike IC. If you want the Boxter club that looks fancier but is just as (ahem) frugal, get the Odyssey White Hot Sabertooth and call it a day.